Foot traffic is consistently high in Florida, especially because of the weather and attractions that bring so many tourists and visitors to our state each year. While a larger number of pedestrian accidents are likely to happen in bigger cities as opposed to small communities, such accidents can happen anywhere and the consequences can be devastating. Pedestrian accidents can also be more challenging to investigate, especially when someone involved in the accident flees the scene, leaving a pedestrian alone with significant injuries and no help in sight. While pedestrian accidents can be tragic, injured victims do have an opportunity to seek compensation for what has happened to them. However, to have the best chance possible of receiving compensation, it is crucial to speak with a Florida Pedestrian Accident Attorney right away after an accident has happened. It is very important to keep in mind that pedestrians have the potential to cause accidents just like a person operating a motor vehicle. For example, a pedestrian who is texting while crossing the street is being inattentive in the same way that a driver is inattentive when texting while driving. However, drivers are often in a better position to avoid a pedestrian accident, and pedestrians do not have the same ability to protect themselves from a collision. As such, before fault can be determined, it is imperative to have a Florida Pedestrian Accident Attorney evaluate potential causes and draw conclusions as to what went wrong and who may be to blame. Before determining what party is at fault for causing a pedestrian accident, it is first essential to determine if any person involved in the accident was considered a “pedestrian” under Florida law. In Florida, any person traveling on foot is considered a pedestrian. A person who is standing by his or her stalled vehicle would not be considered a “pedestrian” under Florida law. Additionally, there are some situations where a bicyclist may be considered a pedestrian for purposes of applying certain no-fault laws in Florida. What this means is that every pedestrian accident must be evaluated on its own terms, as no two accidents are ever alike. Under Florida law, pedestrians and motorists have equal rights to share our public roadways. As such, pedestrians and motorists must respect one another and share the road in the same way that motorists and bicyclists should share the road. Often, however, many motorists feel as though they should have the right-of-way and that pedestrians simply need to yield to the person behind the wheel. Such conduct can lead to unnecessary accidents, many of which are preventable if both motorists and pedestrians are (1) paying attention; (2) following all traffic laws; and (3) respecting one another’s equal rights to travel on Florida roadways, no matter what the mode of transportation may be. There are numerous reasons why a person injured in a pedestrian accident should speak with an attorney, but one of the most important reasons is that certain “threshold” injuries must be present for an injured pedestrian to seek and recover compensation. Under Florida law, a “threshold” injury is one that results in severe and permanent injuries. For example, a person whose leg must be amputated because of injuries sustained in a pedestrian accident is considered to have a permanent injury and one that results in the loss of a key bodily function – walking. Additionally, if a pedestrian sustains a traumatic brain injury (TBI) from an accident, and a medical doctor determines the TBI is permanent, such an injury would likely meet Florida’s “threshold” requirement. An example of an injury that may NOT be considered a “threshold” injury may be one where a pedestrian has cuts that require stitches, but that does not result in permanent damage. However, because injuries can vary from person to person, speaking with a Florida Pedestrian Accident Attorney is the best way to find out if an injury satisfies Florida’s rule regarding the ability to receive compensation. Children are not treated the same as adults when evaluating pedestrian accidents. Children are more vulnerable and unaware of dangers around them, so motorists must take special care when traveling amongst child pedestrians. In legal terms, a motorist has a heightened duty of care to children as opposed to adults. Therefore, a motorist is expected to be overly cautious when near children. This special duty of care typically relates to accidents that happen in schools or other places where children are likely to be. Permanent injuries resulting from pedestrian accidents leave not only physical and mental scars but also leave an injured person (and loved ones) in financial distress. The expense of medical care has sky-rocketed, and one hospital visit can cost tens of thousands if not hundreds of thousands of dollars. As such, seeking compensation from the person(s) or party at fault for causing a pedestrian accident may be necessary to help the injured victim recover as much as possible to account for the pain, suffering and financial loss resulting from a pedestrian accident. Before deciding to seek legal action, however, it is first important to discuss the situation with a qualified legal professional. All states have laws that place time limitations on how much time a person has to file a lawsuit for personal injuries or wrongful death. Under Florida law, a person injured in a pedestrian accident has four years from the date of the accident to file a lawsuit. If a family member wishes to pursue a wrongful death case relating to a pedestrian accident, the deceased victim’s estate must bring a lawsuit no later than two years after the date of death. There are no exceptions to this rule. Therefore, it is imperative to act quickly by seeking the advice of an attorney. Once the statute of limitations is reached, there will not be an opportunity to seek compensation in the future. Pedestrian accidents, like any traffic accident, can vary from case to case. The case process can last a matter of months, or multiple years, depending on the nature and extent of the case, how badly injured the client is, and the amount of evidence needed to prove a case. Based on the trial verdict, a case may be appealed, and the entire appeal process can take years. While lawsuits and settlements can be stressful, the end result is worth it if a party is held responsible for causing another person’s injuries. Results can never be guaranteed, but by working with a qualified legal team, injured victims are in the best hands possible to fight for their right to receive the compensation they deserve. While there are thousands of attorneys to choose from in Florida, finding the right attorney can be difficult. It is not always easy to determine if one particular attorney is more qualified than another. Therefore, researching potential attorneys is essential to ensure a client is making the right choice. At Parker Waichman LLP, we are transparent with all potential clients and provide ample information that allows potential clients to evaluate our firm and determine if Parker Waichman LLP is the right fit. Additionally, our client reviews and testimonials provide ample information about how our legal team successfully helps injured victims every day. Are pedestrians ever found liable for causing an accident? Yes. Every pedestrian accident is different, so there may be a situation where a pedestrian caused or at least contributed to cause an accident, but there are a significant number of pedestrian accidents involving a motorist who is primarily to blame. Do I need to seek medical treatment if I feel fine after a pedestrian accident? The best outcome for any pedestrian accident is that nobody is injured. However, many injuries resulting from a pedestrian accident are not apparent until days, weeks or even months following the accident. For example, a person may feel completely fine after an accident and only begins to experience symptoms of an injury (such as back pain) well after the accident happened. As such, it is always a good idea to have a medical evaluation after an accident to determine if there are any identifiable injuries. Do I have to work with my insurance company after a pedestrian accident? We all have likely dealt with an insurance company one time or another, and pedestrian accidents are likely to involve at least one insurance company. While individuals involved in pedestrian accidents can certainly work directly with their insurance companies to evaluate potential coverage for injuries, a qualified personal injury attorney can handle communications with the insurance company on a client’s behalf. Such support and representation help injured individuals focus on recovery and allows someone else handle the difficult and stressful nature of insurance claims. Whose insurance covers injuries resulting from a pedestrian accident? If a pedestrian suffers injuries in an accident, it can be difficult to determine what insurance policy (if any) will help to compensate for the costs associated with the injuries. All parties involved in an accident (motorist(s) and pedestrian(s)) must exchange insurance information if they have insurance. An injured pedestrian may have the ability to file a claim under his or her own auto insurance policy if another motorist’s policy does not have coverage (or the motorist involved in the accident does not have insurance at all). Because the insurance process is confusing and there are multiple variables that affect the situation, speaking with an attorney right away is the best option for moving forward. Will I be responsible for any expenses related to my lawsuit? There will always be lawsuit expenses that are necessary to pursue a lawsuit to recover compensation for injuries. Such case expenses include but are not limited to, the cost to obtain medical records, expert testimony and reports, accident investigation reports, and depositions, among others. While these costs can certainly add up and seem alarming to many clients, these expenses are not payable UNLESS the client is successful in receiving compensation). As such, if a client is not successful with his or her lawsuit, the client will not have to pay for any case expenses. What if I have an attorney but want to get a new attorney to represent me? If you are already represented by a Florida pedestrian accident attorney but wish to find a new attorney, it is important to act quickly so that your file can be transferred to your new attorney, especially if you already have a pending lawsuit. There are numerous reasons why a person may wish to find a new attorney, and whatever the reason may be, the injured client should ensure that he or she obtains the entire case file from the first attorney and provide that file to the new attorney. The process for changing attorneys does not have to be complicated but does require clear communication. Because changing attorneys in the middle of the lawsuit can cause some headaches, it is always best to investigate options for legal counsel thoroughly before deciding on the right attorney. What if I live in Florida but was injured in another state? 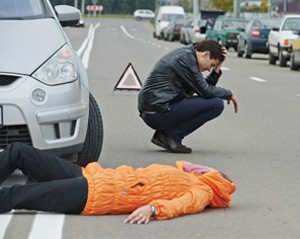 All state laws are different, so the location of an accident is very important when investigating a pedestrian accident. If a person lives in Florida and was injured in Florida, a personal injury lawsuit would be filed in Florida state court. If a person lives in the state of Florida and is involved in an accident in another state, the case may have to be filed in federal court or the state where the accident happened. Because Parker Waichman LLP is a national law firm, our attorneys can help clients regardless of where they live and where they were injured. At Parker Waichman LLP, our Florida Personal Injury Attorneys focus not only on pedestrian accidents and other traffic-related accidents, but also help clients who have been injured on the job, suffered at the hands of medical negligence, or sustained injuries in a slip and fall accident, among many other practice areas. Our firm is nationally-recognized for the legal services and support our attorneys have provided to, and continue to provide to, our clients from all across the United States. While ratings, honors, and recognition certainly are not the only factors to consider when choosing an attorney, being recognized in the legal community demonstrates that clients have been satisfied with Parker Waichman LLP, and would recommend our legal team to others. Not every potential case will result in a settlement or favorable verdict at trial, but there is no harm in having a possible claim assessed by one of our qualified Florida Pedestrian Accident Attorneys at Parker Waichman LLP. Our attorneys work on a contingency fee basis which means that our attorneys only earn fees if a client’s case is successful. If a client is unable to receive compensation, our attorneys will not receive any fee. As such, injured individuals have nothing to lose by seeking the advice of Parker Waichman LLP. If you or a loved one has suffered injuries resulting from a pedestrian accident, it is important to consider speaking with a Florida Pedestrian Accident Attorney as soon as possible. Because there are time limits on how long an injured person has to file a lawsuit, the sooner you can seek the advice of an attorney about your injuries and the accident, the better informed you will be to move forward. At Parker Waichman LLP, our nationally recognized Florida Pedestrian Accident Attorneys are standing by to provide you with the direction and support you need to seek compensation for your injuries. Parker Waichman LLP provides legal representation to clients all throughout Florida, but especially in and around Fort Myers, Cape Coral, Naples, Bonita Springs, Immokalee and Marco Island. To schedule your free consultation to speak with one of our attorneys, contact Parker Waichman LLP today by calling (800) YOUR-LAWYER (1-800-968-7529). We have attorneys and paralegals standing by who are fluent in Spanish to offer assistance to Spanish-speaking clients. Have you or a loved one suffered injuries resulting from a pedestrian accident?